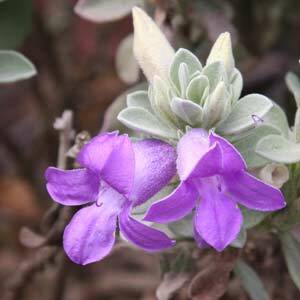 A small flowering shrub Eremophila hygrophana is from Western Australia and with its attractive mauve to purple flowers makes an excellent garden plant. We find that this is a relatively easy Eremophila to grow, we also think that with its attractive flowers and good grey green foliage it is one of the more desirable garden plants from the genus. Commonly called the ‘Blue Emu Bush’, this is a low maintenance plant one established. The flowers have the habit of changing colours as they age. Excellent in hot dry conditions, however like most Eremophila this species will not grow well in humid conditions. This very attractive Australian native has found a place in gardens overseas, especially in California and Texas. This evergreen shrub is best grown in a garden bed with a raised garden bed (mounded up soil) to improve drainage beneficial. Pruning is rarely required as Eremophila hygrophana has a good naturally compact growth habit. Best planted near the front of the garden as this allows the flowers of this low growing shrubs to be more easily seen. Tip pruning after flowering will help produce a more bushy growth habit. Hard pruning is not recommended. Not well suited to long term growth in pots or containers although with some care it is possible. Height – Will reach 1 metre. Foliage – Silvery green. The fine hairs on the foliage provide some insulation from very hot conditions. Flowering period – The main flowering time is from autumn to early summer.